Here's wishing everyone and their family a Merry Christmas! Last weekend the NEMQG held a holiday mini quilt challenge with our pincushion swap. 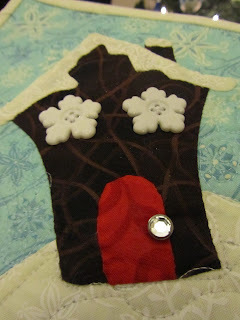 I decided to make a small quilt using needle turn applique that we learned in our last meeting. I knew that I was going to be busy traveling for work, so I saw that as the perfect time to work on a needle turn applique quilt. 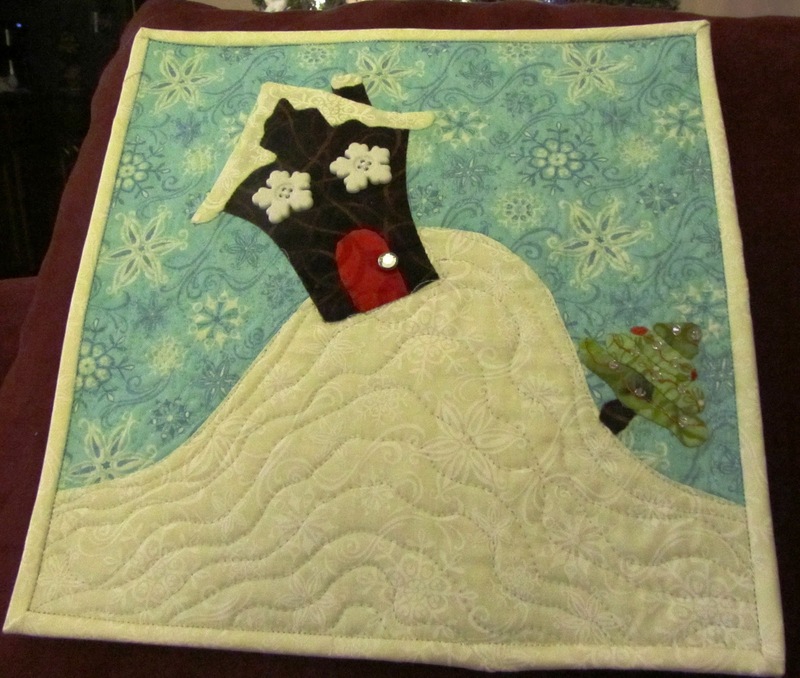 I designed the quilt myself after sketching up a few different designs and settled on a gingerbread house and a Christmas tree. 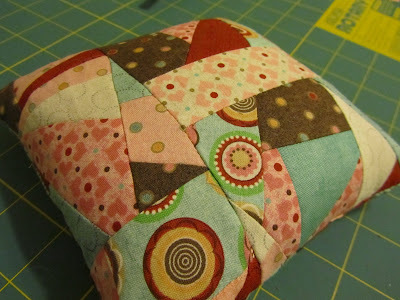 I made it using the scraps that I had from the Fat Quarter Shop's Designer Mystery BOM except for the brown house. I added some crystals to the Christmas tree to look like ornaments. Here's the house. The windows and door knob are made of buttons. 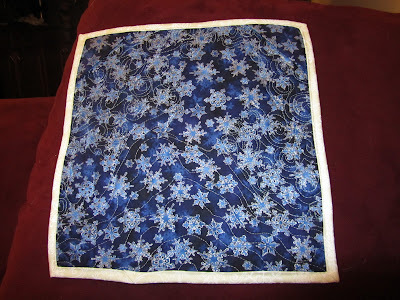 Here's the back of the quilt where you can see some of the quilting that I did. 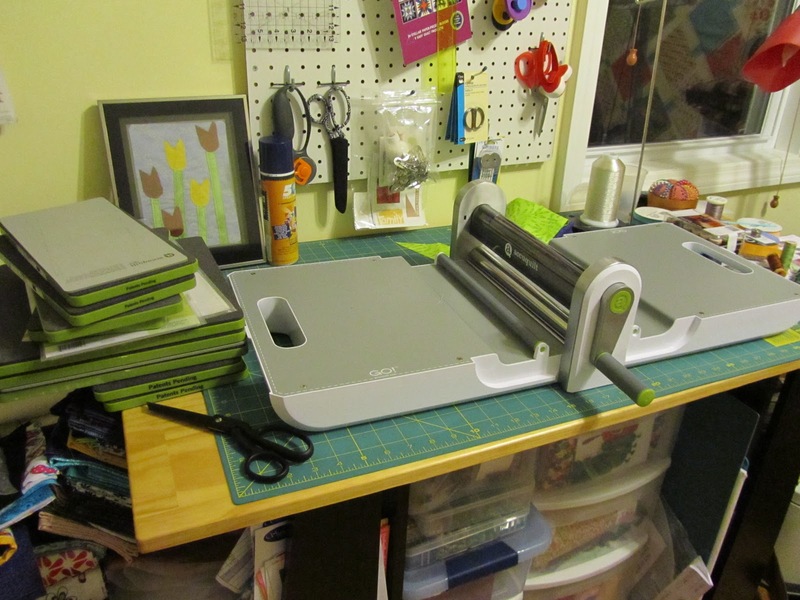 I was running short on time for the binding, so I ended up machine stitching it down using some metalic thread. Now for the competition. 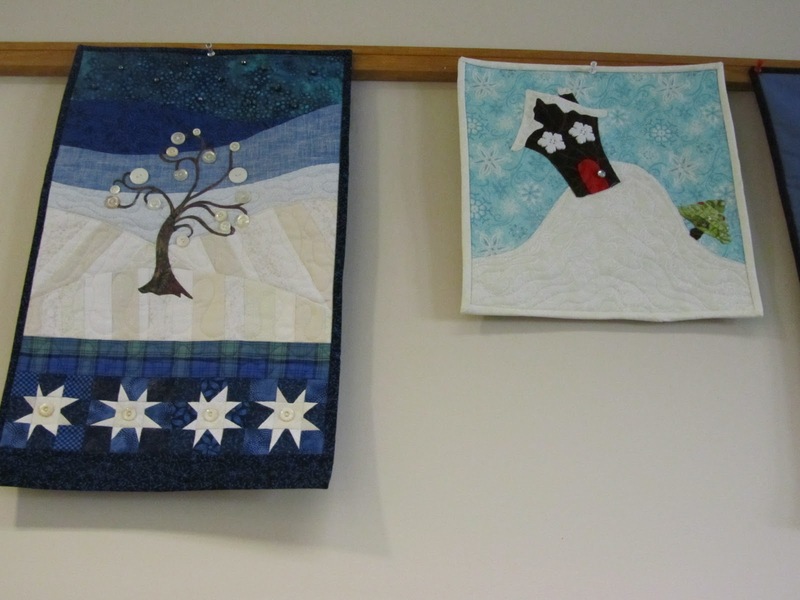 There ended up being four quilts total entered into the challenge. After seeing all of the quilts up there, I knew I had no shot of winning. I mean, come on, look at some of those. They're fantastic. Everyone at the meeting was given a piece of paper to vote on their favorite quilt. After the tally, quilts 3 and 4 (from left to right) were tied for third place and quilts 1 and 2 were tied for first. I have to admit, I was a bit shocked when I learned I was tied for first. 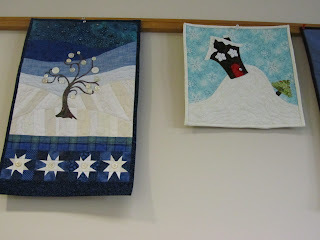 Because there was only one winning prize, we had to have another vote off between quilts 1 and 2. After the second tally, again quilts 1 and 2 were tied. (I was shocked that I was still in it, much less tied for that awesome quilt on the left.) Then, we realized that we were missing one vote, the deciding vote. After all of the votes were recounted and the tally was final, MY quilt was dubbed the winner!!! Holy cow!!! 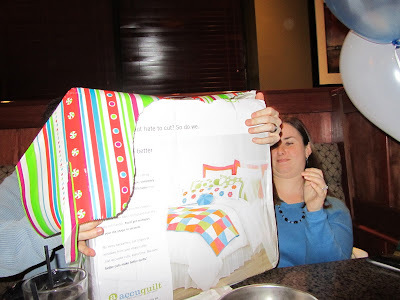 I seriously never expected to be the winner after seeing all of the cool quilts. 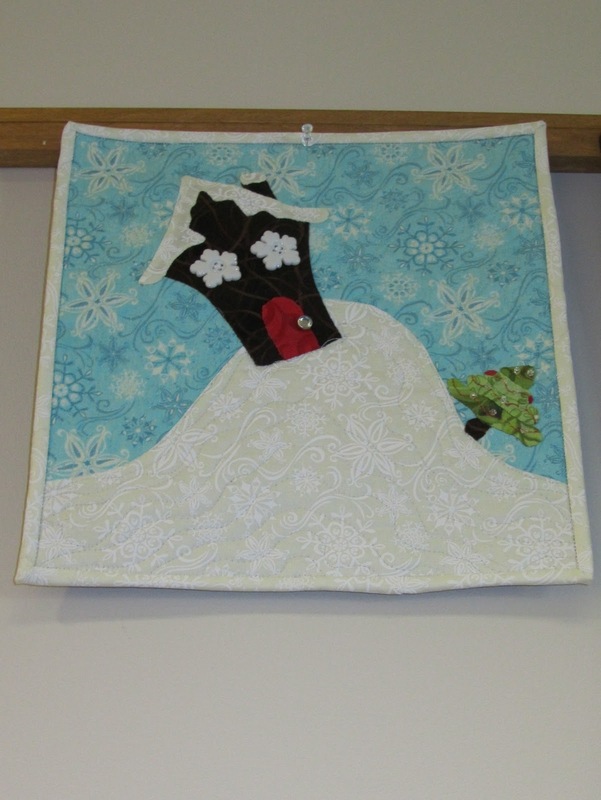 So now this cute quilt is hanging in the hallway off our kitchen to our master bedroom. 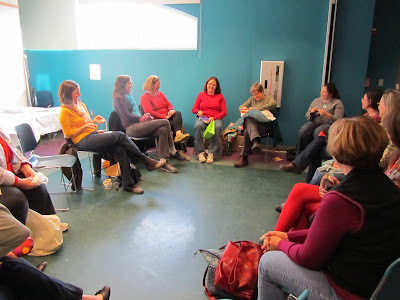 On Saturday, at the NEMQG, we had a pincushion swap. 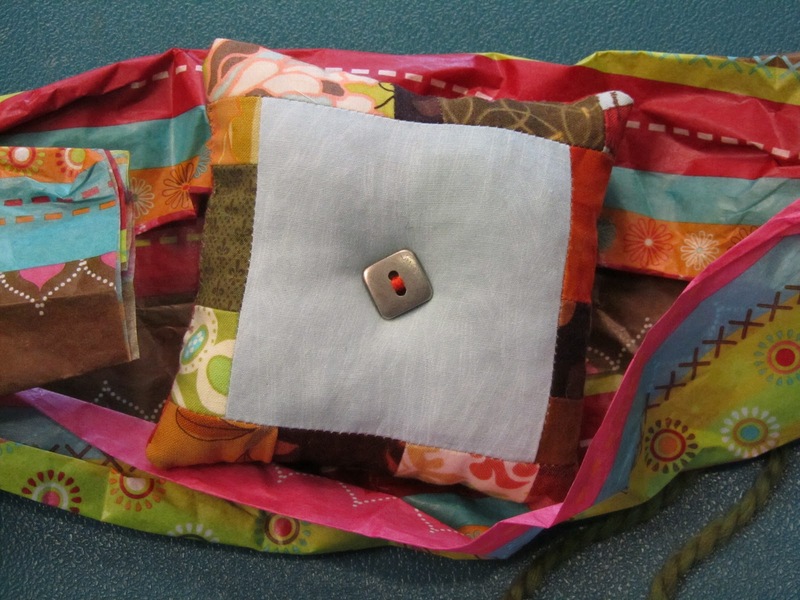 It was a "bring a pincushion, get a pincushion" swap. Here's the pincushion that I made for the swap. I made it using the leftover scraps from the Carol Doak Radiant Star BOM. All of the pieces that I had leftover from trimming the paper pieced blocks became this pincushion. I filled it with crushed walnuts. I loved it and didn't really want to give it away, but I did. Here we are swapping pincushions. And this is the pincushion that I received. Isn't it cute? 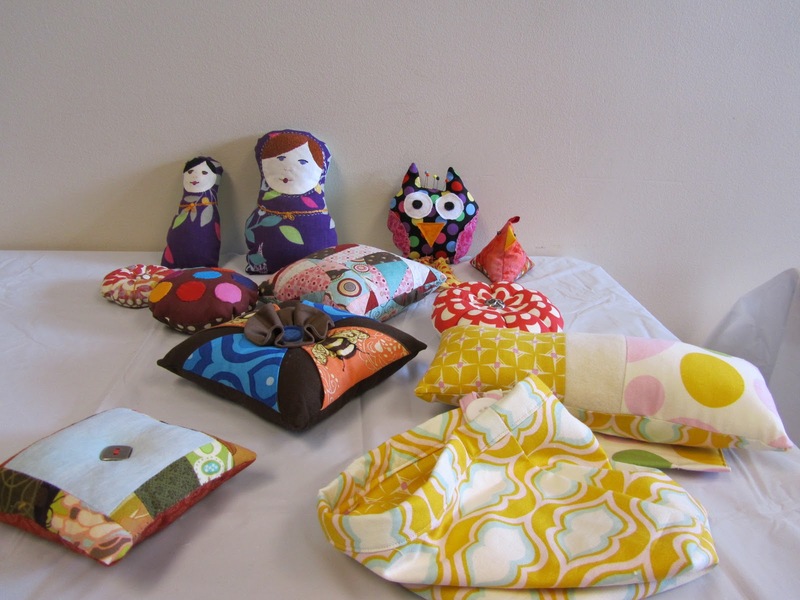 And here are all of the pincushions. I wish I could have taken them all back with me, but if I did that I'm guessing I wouldn't be welcome back to the group. So, I resisted. At the beginning of the year I developed some goals for myself for the 2010 quilting year. I thought that this would be a good time to revisit them and see how I did throughout the year. Goal 2 - Buy less fabric and use from my stash. Hahahaha. This is a funny one. Yeah, about that. I never actually took inventory of how much fabric I had at the beginning of the year, but I would be willing to bet my Bernina that I have more fabric now than I did on January 1, 2010. That's saying a lot. I don't think I ever thought I was going to have less fabric, but I wanted to consciously use some of the fabric that I already have. Goal 4 - Continue Blogging. All in all, I think I did a pretty good job of maintaining my goals. 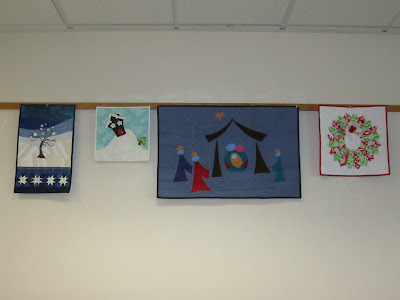 I managed to finish 12 projects this year, 5 of those were quilts. I'll showcase my finishes for 2010 after the holidays and when I can share more about some of them. 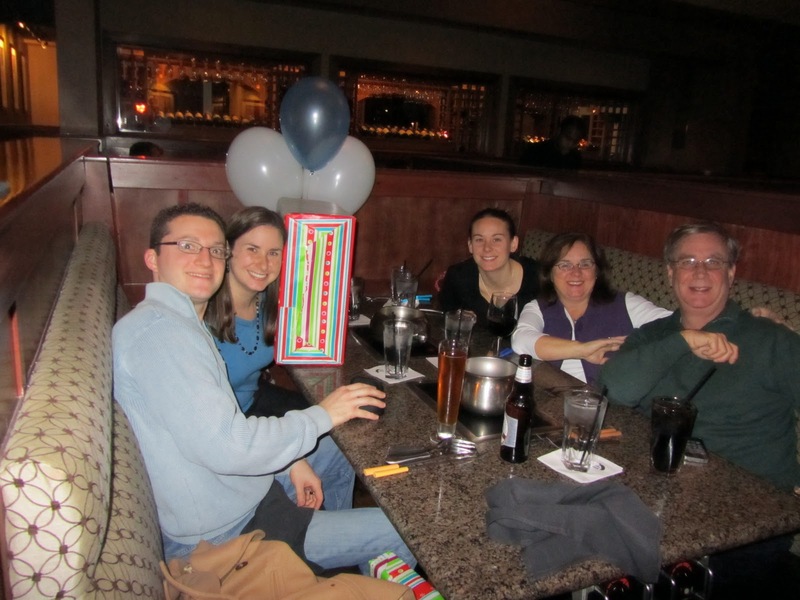 Yesterday I celebrated my 26th birthday. Saturday my family and I went to dinner at our local Melting Pot to celebrate. See that package in front of me? Can you guess what that is? 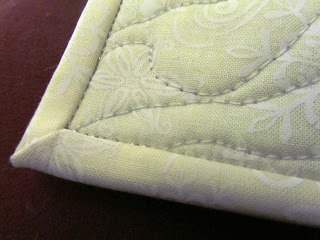 I'll give you a hint... it's quilting related. So guess what I did yesterday? I had to play around a little bit. 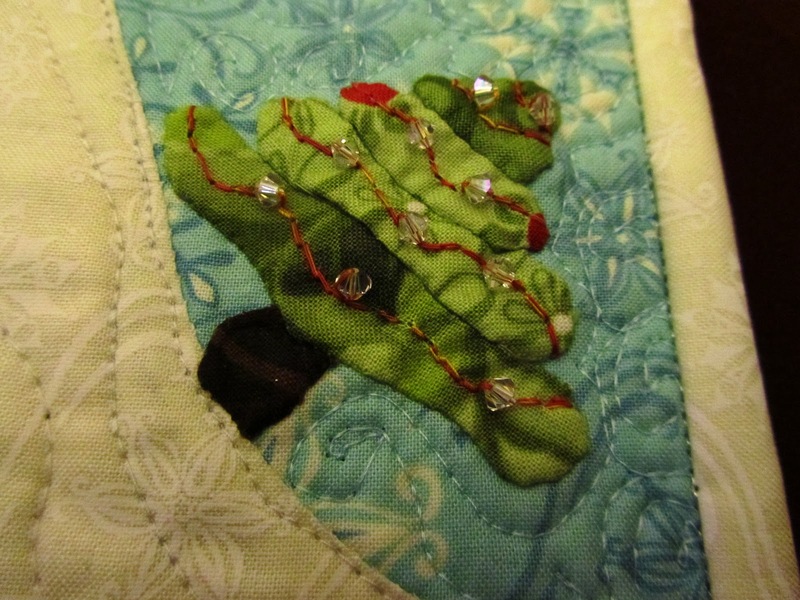 I also worked on finishing up my mini holiday quilt for our NEMQG challenge for our December meeting this coming weekend. I'll share that next week since we're having an unnamed competition. I haven't had that much to share lately as I had some family in town for Thanksgiving and then I was traveling for work. The few things that I have been working on are Christmas presents for folks who follow this blog, so I can't share those either. Hopefully after the holidays I'll have more to share.